It has admittedly taken me far too long to write this but it’s because it’s such an important subject to me that I want to do my story justice! I guess I’ll start by saying that I have had acne for 10 years. The years I should have been my most confident were ruined by the fact I had horrendous cystic acne. I’ve always been outgoing in social situations but inside, would always be deeply embarrassed about my face and paranoid that people were staring. I tried countless long term courses of antibiotics (some of which made me really ill) as well as daily topical creams which burned and dried my skin out). I also experimented with cutting things out in my diet, excerising, drinking more water, switching up my skincare regimes and none of these helped lessen the blemishes on my face. After 10 years of this my doctor finally referred me to a dermatologist for a medicine called Roaccutane. Because of it’s intense side effects and the fact that you must not get pregnant whilst on the medication, it means monthly visits to the dermatologist for check ups, blood tests and pregnancy tests. I’m not going to lie, it’s an intense drug! 1) So I could document and compare how my skin was changing on a daily basis, to either give myself or other acne sufferers some hope! 2) To get rid of some of the bad stigma surrounding this medicine and to show the reality of it. 3) To emphasise that it’s okay to show your imperfections – no one is perfect and hopefully this will help some people going through the same thing. I am now currently three months into my Roaccutane journey but I still have 5 more months to go so still lots of content to come. Each month there will be 2 Roaccutane based videos on my YouTube channel. The first will be a recap of the side effects over the previous month with before and after pictures so you can see how my skin is improving. The 2nd video will be a ‘daily skin vlog’ where I have filmed my bare skin every day to show how it’s changing daily. If you have watched, shared, commented or supported any of these videos, thank you so much. I really appreciate everyone’s support and positivity. The feedback has been so overwhelming and I couldn’t be more grateful to have such beautiful humans watching my journey. I wanted to ask here if you guys would like written update posts from each month as well as the videos? I’m unsure of wether to write updates from the first two months as they’ve already been and gone but happy to write up monthly going forward – just let me know! Next Post SEVENTEEN BLOGGER NETWORK EVENT! I would like to see written posts but only if it's not too much additional work for you. I've had acne for almost 20 years now (I'm 34 years old) and nothing seems to help. Granted, my acne is not as bad as it once was but it still makes me feel very self-conscious. I've used Roaccutane 10 & 20. 20 was more painful than 10 (dry skin, red, delicate lips,…). It'll help you a lot so don't give up! I finished Roaccutane earlier this year after 15 years of acne – it has worked wonders. It is tough going but I think well worth it in the end. 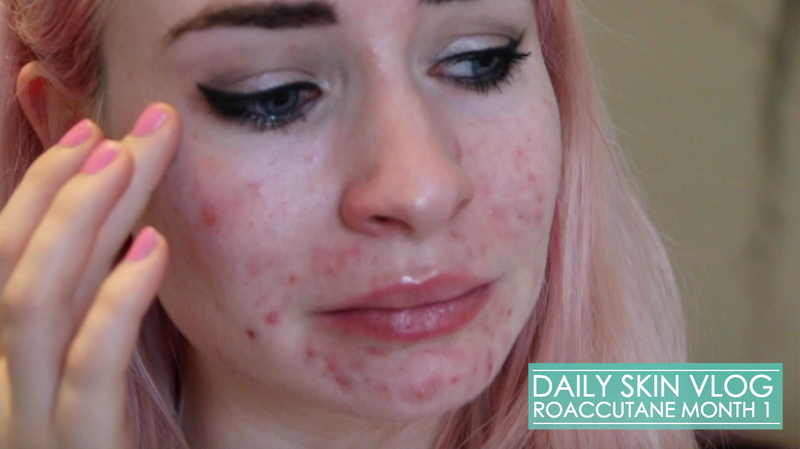 Seeing the vlogs really takes me back to my own struggle with acne and my roaccutane journey. My breakouts weren't as bad as yours, but still, I can relate. As for the written posts, sure, why not, the more people you can reach and help with this issue the better. Hi Katie, thanks for your honesty! I saw u were looking for lipbalms, have you tried lanolin based ones eg lanolips? Thank you for sharing your story. It helps people understand that acne needs to be taken very seriously and understand how much it affects peoples quality of life. I once read an article written by my dermatologist who said that acne mentally affects you just as much as having cancer, I know acne is not life threatening (! ), but is it still thought-provoking. I too have been on accutane, which I reacted VERY strongly on. I had all the side affects; insanely dry skin and lips (i could peel off my skin in big pieces), had temporary arthritis, fatigue and it even made my skin look even worse! When it peaked I had 40 pimples on my cheeks (which gave me a lot of scars) and my face would hurt each time I laid down on my pillow. Please please please, get a food allergy test before you put any cream on, or take any pills! I promise you it will be a game changer. In particular, seek a type of test: google "acupuncture allergy test" and find the nearest centre near you. I had very aggressive cystic acne from 13 until 28 all over my face, neck, shoulders, back. It physically sore, and emotionally obliterating. Through an intolerance test, I discovered I was intolerant to yeast, in the form of candida, aka – very bad gut health. Very bad indeed. It is a fungal growth on the lining of your gut, and to put it simply, it feasts on sugars. And then releases toxins into your blood stream, your acne is a symptom of that. Do you know what else promotes very bad gut health? Antibiotics of any sort. They completely imbalance it. So not only does roaccutane wreck your gut health, you lay the risk of depression/anxiety/suicidal thoughts too … fantastic! Give someone whom already suffers emotionally and psychologically a pill, that will just heighten the chances of a side effect setting in. Better yet, teenagers – whom are at a vital age of brain development are allowed to take it. Katie, I think what you are doing by documenting your journey so honestly is very brave, humbling and extremely important – as it opens up a dialogue. A journey that I could not empathise with any closer! I sincerely mean that. However, I just feel that the severity of the possible side effects in your BBC Documentary were not emphasised enough. And I would never assume a presenter is an expert on the subject within the program, because I understand that the concept of the program was your personal journey, and other people journeys and experiences … it was the Doctor featured in the program that took me a back slightly. She stood out me because I felt the negative side effects were not emphasised enough. Please don't take me out of context though. Your documentary was good, congratulations on it. And you as a young presenter have a bright future ahead of you. I was recommended by two different dermatologists, at two different times in my life to take the drug. Because it "is" the last resort. It honestly isn't. My personal opinion and experience is that you shouldnt bow down and accept that feeling of "ah well, I'm going to have acne for the rest of my days, better get used to this feeling…better try to start loving myself for what I'm am(not)" . <—– that right there was the driving factor me, the possibility of accepting defeat. Keep searching for your cure! I was put on a yeast free, sugar free (completely … no natural sugars in the form of fruit) for 3 months. I ate lots of raw veg, healthy fats, moderate>low proteins as my diet. And got onto a course of Pro Biotics. At 28 years old suffering severe acne for over 15 years, it began to subside in 6 weeks. By 3 months it had stopped. One year on at 29 years old … I have absolutely zero acne. I have cut my candida by 2/3rds, but it has taken me over a year to get it down, and I'm not in the clear yet. It takes time. Remember – you have been working on your acne for years: by fuelling it with all the wrong things in your gut. The moment I defeated my acne, everything in life just started clicked into place, effortlessly. Im a 29 year old male, and I've only just started life! Please, if you want to take any context from this: thinking about taking the drug? Consider the side effects: joint pain, depressed mood, trouble concentrating, sleep problems, crying spells, aggression or agitation, changes in behavior, hallucinations, thoughts of suicide or hurting yourself, let alone all the skin bleeding peeling flaking etc. Maybe thinking about giving a food intolerance test a go first? Consider the side effects … better gut, healthier glow, clearer thinking, more energy, better sleep, a little bit of flab loss, less acne… whats the worst that could happen in trying it first, at least?